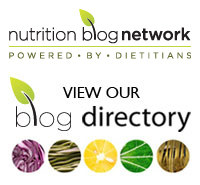 You are here: Home » Coconut oil lowers blood pressure –really? 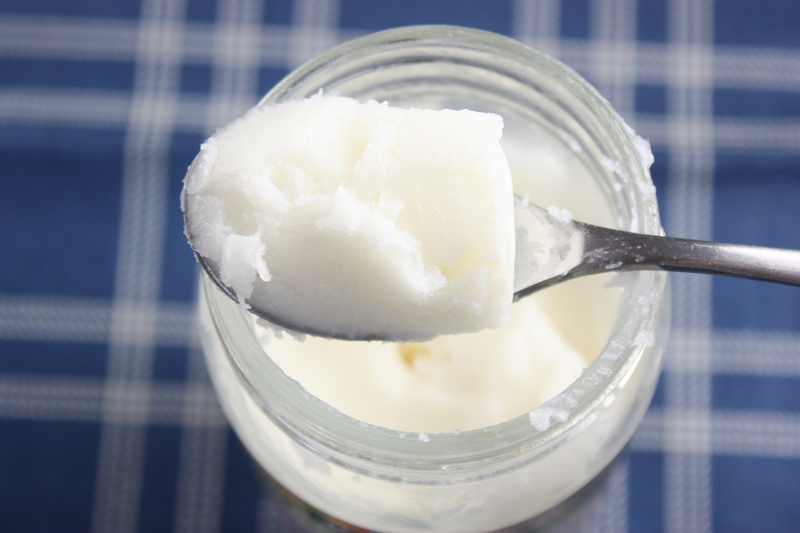 Coconut oil lowers blood pressure –really? Have you ever heard of the game Broken Telephone? It’s a kids’ game where you whisper something into the ear of the person next to you. That person does the same until you get to the last one who announces what they have heard. All too often, the outcome has nothing to do with what was said in the first place. Have you noticed that, as of late, scientific studies ( and sometimes the reporting of these studies) may resemble Broken Telephone? The study’s conclusions or what is being said may have little to do with any valid outcomes. Case in point: I came across a tweet about coconut oil and its effect on high blood pressure. The headline stated, “Virgin Coconut Oil Effective in Treating High Blood Pressure” so I had to check it out. Much of the hoopla about coconut oil has not had a basis in scientific evidence so I’m always on the lookout for real science. The study compared 4 groups of rats over a 16-week period: those fed five times-heated palm oil, virgin coconut oil, a combination of the two oils and a control group. Heating oils repeatedly is known to have adverse effects on health. The scientists found, not surprisingly, that from week 8 through week 16, the blood pressure readings in the heated palm oil group was elevated compared to the control group. When they mixed the palm oil with the virgin coconut oil, the blood pressure readings were less than the straight – might I say rancid – palm oil. That’s not saying much. I don’t think this particular finding points to any real benefits of the coconut oil but simply that there was less of the harmful rancid oil. Now here’s the kicker- there was a decrease in blood pressure in the virgin coconut oil group but only – I repeat only – at week 8, not through weeks 9 to 16. 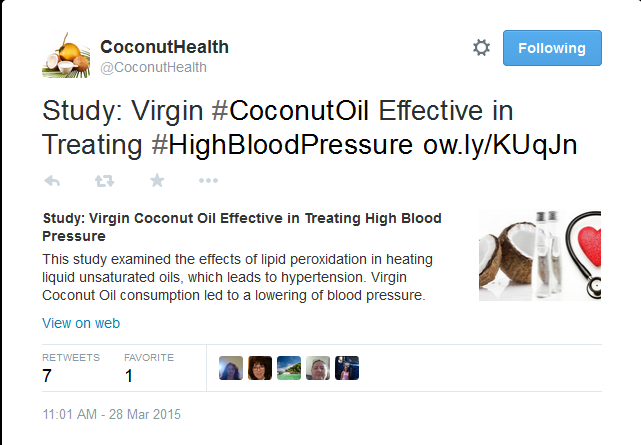 So how does the headline and title of the study become “Virgin Coconut Oil Effective in Treating High Blood Pressure”? It is indeed a mystery to me. The study was funded by a grant but the only identification is the number – Grant UKM-FF-03-FRGS0031-2010. Is this a group affiliated with coconut oil? Are you a fan of coconut oil? Have reports of its health benefits had an impact on you? Please share your thoughts in the comment section below. I love coconut oil and use it in moderation, usually in fits and starts. My body seems to crave it from time to time. I became a fan after reading the work of Mary Enig several years ago regarding the function of medium chain fatty acids found in tropical oils. At the time I was particularly interested in the effect of these oils on depression, and still enjoy the “feel-good” consequences of consuming coconut oil or recipes with coconut milk. Overall, though, I would use far more olive oil than coconut. Thanks for your comments, Betty. I agree that coconut oil can have many tasty and possibly healthy uses but I would love to see more sound science on it – the sound science that exists for extra virgin olive oil. I now use coconut oil instead of butter and I honestly noticed no difference. I started using 3tbs of coconut oil last April to try and lose weight, in July I started getting dizzy, after 3 days of being sick, I checked my bp. I normally take 2 bp pills in morning and at nite. The coco oil lowered my bp enough so that my doc took me off the morning pills. I’ve been on those pills over 20 years! It’s been one year now and I still only take them once a day. Had blood work up last week and my lipid panel is all in the good range(first time in years) and my glucose is the lowest it’s ever been!! Kathy, that’s great news about your blood pressure! I haven’t seen these kinds of results being reported in studies but I’m glad to hear you’re doing so well. Yes, weight loss does have an effect on blood pressure readings and it sounds as though your three months of trying to lose weight have paid off. I do have to ask though, if there were other changes that you might have also made that would contribute to the success you are seeing. For example, did you boost your intake of fruits and vegetables? Not only would this help with weight management but could also help in reducing your blood pressure. Improved lipid and blood sugar readings also go hand in hand with weight loss. Congrats! Well . I came here because I was looking for a cause of my BP suddenly going higher .I was blending my vegetables and drinking them everyday (a mixture of kale and some other green leave vegetables .at the same time I started taking 2 half tablespoons of coconut oil .half in the morning and half in the evening .then I started to feel chest discomfort .something like pressure in the chest .I was suspecting was anxiety or something so I stopped taking my vegetable shake thinking that maybe too much potassium was interacting with my meds which is betablockers . So after than more than week without drinking the shake I still feel that sensation of lack of breath and chest coldness . (I dont know how to describe it) . I checked my BP and it comes out high . So I have been still taking coconut oil . So what could be the cause .? I will stop taking it and come back with results . Marco, I would suggest you see your physician first. When it comes to symptoms/issues such as this, it’s best to be safe rather guess and be wrong. Wishing you the best!